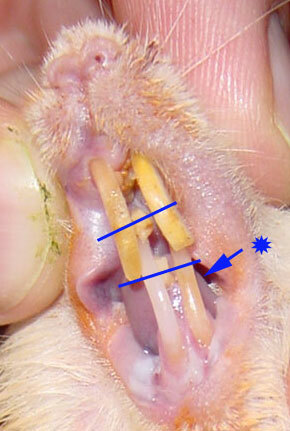 Rats trim their own teeth! However... there are certain (rare) instances where, for reason of moon misalignment, abscess, age, whatever...that a rat may simply have rampantly growing teeth. 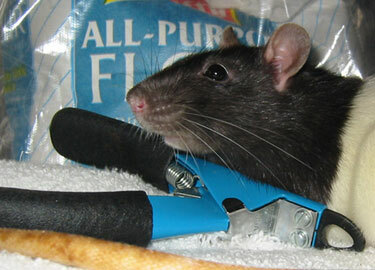 Do not trim your rat's teeth unless you absolutely have to! 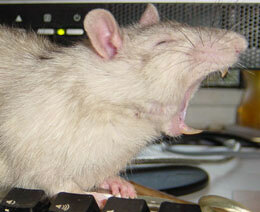 AND...If you don't feel comfortable doing this, take Templeton to the vet!!!! 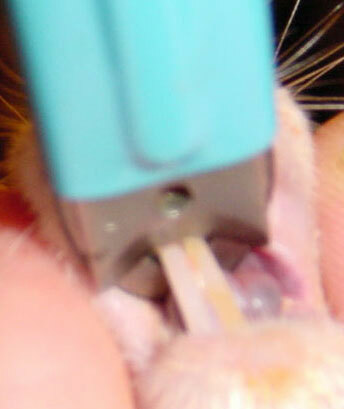 Rat needing a tooth trim. All-purpose (styptic is the purpose in this case) flour. STEP 1: Look at the teeth. I have rarely had to trim both top and bottom teeth. Usually it's one bottom tooth (misalignment) or both bottom teeth (rat gets sick, avoids foods other than sweets and soft foods, teeth grow). In this particular case (BooBoo, pictured) there was an abscess and you can see where the abscess was because his dinner (yum, yum) is stuck in the hole that you can see on the roof of his mouth. Why didn't I clean this, you wonder? Well, because this would wake him up and the following pictures would have never happened...so we cleaned afterwards. I suspect he stopped grinding his teeth down because it hurt. Now he is physically incapable of grinding his teeth down, I suspect, because the top teeth are now apart. 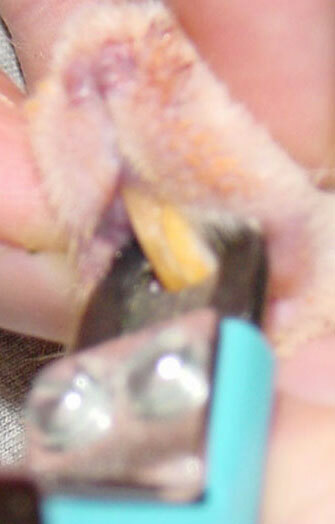 Yellow/orange coloration of the incisors. Smooth pointed tips (rather than blunt). Within 1mm accuracy, upper incisors are both the same length and lower incisors are both the same lenth. Here is where I've judged the teeth need to be trimmed. In this case I am judging the top teeth based on where they start to curve outward. They are still very yellow and therefore "healthy." Cutting these too high will cause them to bleed...and bleed a lot. The bottom teeth are not so healthy. As you can see, the one on the left is white. This tooth is very fragile. I'm going to use the tooth on the right (*) to determine where I am going to cut. The vein that supplies blood to the tooth will stop right above that yellow (where it becomes white). 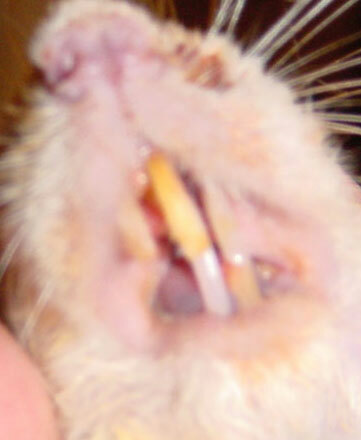 If you are still unsure, the very best thing I can recommend is to get another rat and look at his teeth. It's a lot easier when you have a comparison guide. 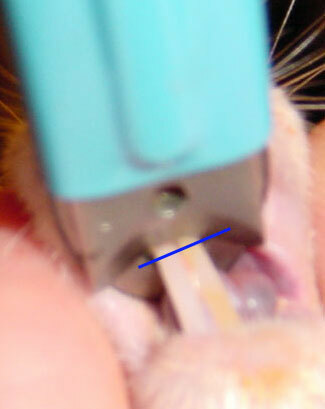 If there is any hope that your rat is going to start grinding his own teeth down again, you'll want to cut diagonally so that the clippers are pointing upward. This will create a nice shelf on which to rub the lower teeth. 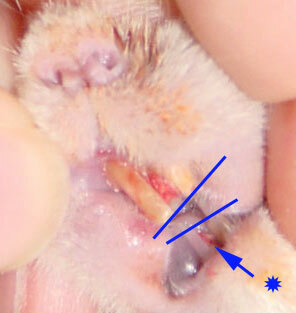 STEP 3: Check for bleeding and check that the teeth are even. Here is what the top teeth (albeit blurry) looked like after trimming. Notice that I did a really poor job (with both photo and trim). 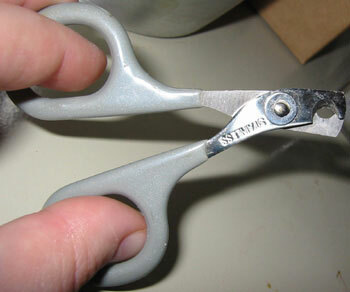 Although I snipped both at once, I flinched so the tooth on the right was a bit longer than the one on the left. I evened it up after this photo was taken. Now for the bottom teeth....looking at this photo I see now that I was cutting too low. You want to see a bit of white right below what you are going to cut to be sure that you're not going to hit that vein. 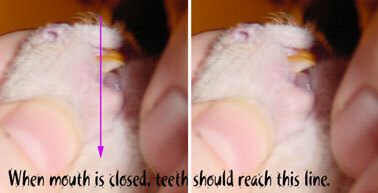 You can also, usually, trim the bottom teeth one at a time if you use the standard nail trimmers. You want to aim for a straight cut. Unlike the top teeth, the bottom teeth do not need to be diagonal as they will use their top teeth to grind them down evenly. 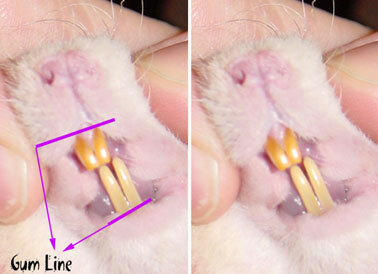 The diagonal you see in a rat's healthy mouth is a result of the grinding of the lower teeth. 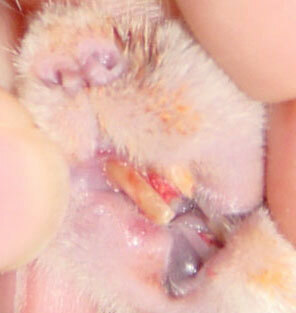 STEP 5: Check for bleeding and check that the teeth are even. The teeth are even. On healthy teeth you'll have no problems making a clean cut if you stay sufficiently above the dark. And remember, you can always do this every 2-3 days to avoid cutting so low. Like I said, I did a pretty bad job on the lowers. The tooth on the left (the very unhealthy one) has split (*) down the inside (again). I had a little blood on the tooth on the right (not a lot) as well. A little bit of flour on those splits stopped the bleeding. If this is your first time....the thing I found the most disconcerting was the sound of the teeth snapping. It hurt me far more than it hurt the rat - he just wanted the snippers out of his mouth but it didn't seem that he actually felt the tooth split (or at least they don't react to it). P.S. I was kidding about the raisin thing....They've never raisined on me for trimming their teeth. will take you back to this table of contents! Remember! Your rat is not a science project, he is your friend!